I have been guiding the battlefields of the Western Front for twelve years and take both adult and school groups across each year. No matter where the groups come from I will always intertwine my visits with stories of Norfolk Regiment men. On my latest tour, which I conducted between 21st and 22nd March with Lydiard Park Academy, who come from Swindon, I introduced them to a number of areas where the Norfolk Regiment served and where men fell whilst also showing them various aspects of WW1. According to the Commonwealth War Graves Commission 741 men from Norfolk Regiment now lie in Flanders Fields. Whilst there I took the group to four specific sites where you will find them. These are Tyne Cot Cemetery and Memorial, the Menin Gate, Hooge Crater Cemetery and Essex Farm Cemetery. Guiding for me is a mixture of showing groups some of the well-trodden areas of places on the Somme and the Ypres Salient and also being able to go off the beaten track to show areas that do not get visited as much. On my last tour it was looking at sites around Ypres. It is also about trying to get a balance right were myths are debated and the truth is told. The first area on my itinerary was Hooge. Hooge is situated on the Menin Road and was a central point for the Germans pushing towards Ypres during the 1st Battle of Ypres between October and November 1914. Later on in the war this area became a focal again when we pushed the Germans back either side of the same road. 18 men from the Norfolk Regiment now rest in Hooge Cemetery. 16 men come from the 1st Battalion and 2 come from the 8th Battalion. They fell between August and October 1917 during the 3rd Battle of Ypres. Two of these men are Alan Jack Dix who was the son of Robert and Maud Dix of 87 Mill Hill Rd in Norwich and Horace Andrew Pembroke who was the son of Peter and Margaret Pembroke from Ilford in Essex. 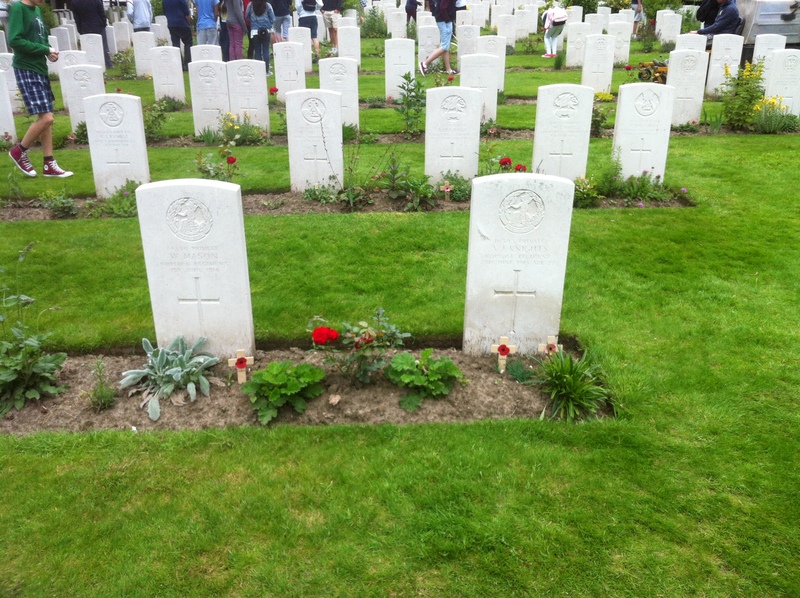 The graves of Alan Jack Dix and Horace Andrew Pembroke who now lie in Hooge Crater Cemetery. 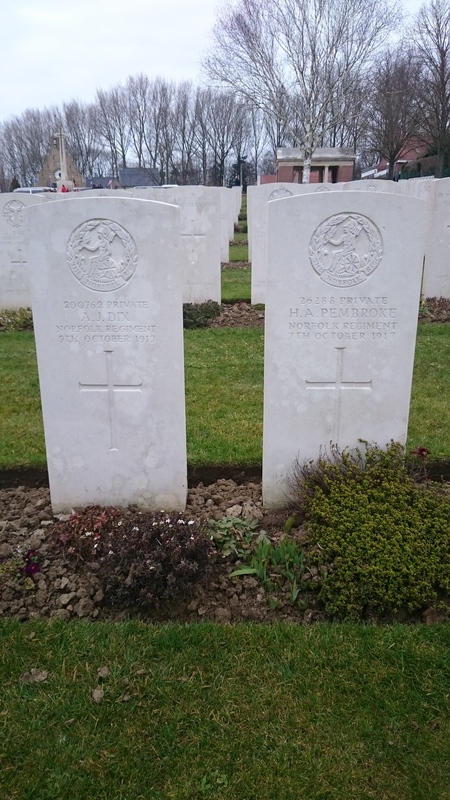 Horace was killed on 7th October 1917 when the 1st Battalion was relieved by the 16th Royal Warwickshires around Inverness Copse and Alan died two days later when the battalion was put back in the line to assist in the assault on Polderhoek Chateau. The Norfolks assaulted at 05.20hrs and the attack was a failure due to the battalion on the right being held up and the weather conditions being atrocious. In that period alone the battalion lost 38 killed, 144 wounded and 112 missing. We next moved onto Hill 60 and the Caterpillar Mine. The 1st Battalion Norfolk Regiment came here in March 1915 serving both around Hill 60 and Verbranden Molen from that time onwards until June of that year. In that time they fought at the 2nd Battle of Ypres and many of their casualties were lost to artillery and gas. One of the most notable was the battalion’s Adjutant Captain William Cecil Kennedy Megaw. William was killed in action on 31st March 1915. 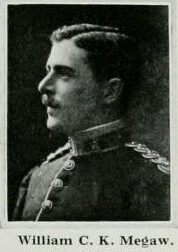 Captain William Cecil Kennedy Megaw who was killed in action serving around Hill 60 in March 1915. I use Hill 60 as a point of reference for the fact that Germans often held the high ground and from this point you can look towards Ypres. I also talk about the mine warfare that occurred here, culminating in the Hill 60 and Caterpillar mines being exploded here on 7th June 1917 at the opening phase of the Battle of Messines. Essex Farm is situated on the Yser Canal and was once used as an Advanced Dressing Station between 1915 and 1917. Men would be transported there from the battlefield and treated prior to being evacuated. Sadly 1,200 Commonwealth and German servicemen did not recover and are now buried there. This includes 3 Norfolk Regiment men. They are Eli Cox, Alfred Knights and William Mason. Both Alfred and William were killed in action serving with the 9th Battalion on the night of 1st/2nd June 1916 during a working party. Alfred was the son of Arthur and Emma Jane Knights of 6 Cozens Road in Norwich and had served with the battalion since 4th October 1915. Not much is known about William but he had served with the battalion since 30th May 1915 and was born in St James. Alfred Knights who was killed in action 2nd June 1916. Eli is listed as serving with the 7th Battalion but at the time of his death he was attached to the 173rd Tunnelling Company Royal Engineers and was killed in action on 9th June 1916. Like a number of men in the 7th Battalion Eli had been posted to the 7th Norfolks from other parts of the country and he was the son of Mrs. E. Cox, of Red Cottage Greenfield near Ampthill in Bedfordshire. The graves of Alfred Knights and William Mason in Essex Farm Cemetery. Essex Farm is also the final resting place of the most visited 15 year old in this sector. 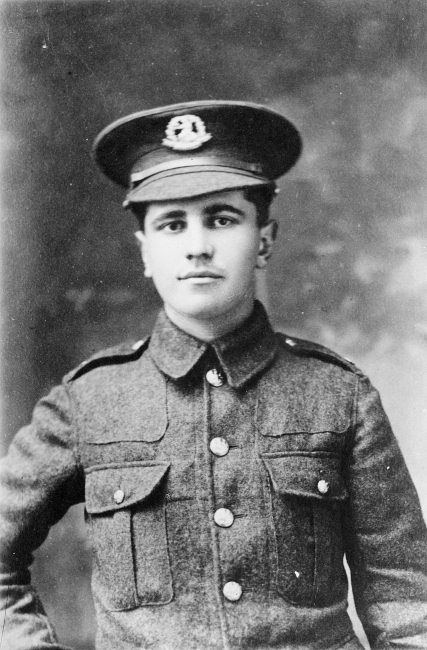 Valentine Joe Strudwick was serving with the 8th Battalion Rifle Brigade when he and a number of other men were killed in action when a shell landed in their trench. They are buried in a row next to each other. Secondly the dressing station was home to John McCrae who was serving with the Canadian Expeditionary Force in May 1915. He was inspired to write the famous poem In Flanders Fields after his friend Alex Helmer was killed. Whilst at Essex Farm I show my student groups both of these famous individuals and ask someone from the group to read out In Flanders Fields. 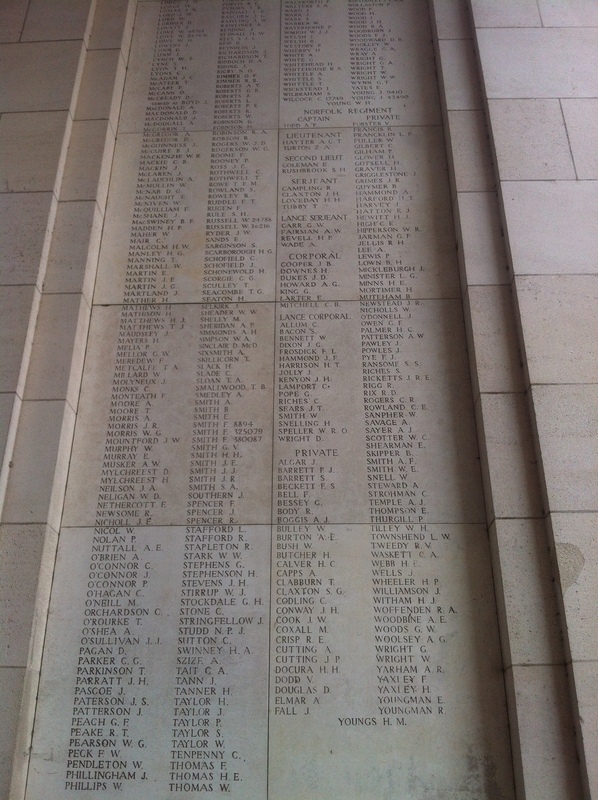 54,395 men are recorded on the Menin Gate, 138 of them are recorded on the Norfolk Regiment panel. Every evening, 365 days of the year, come rain or shine, members of the Belgian Fire Service play the Last Post at 8 p.m. in a ceremony that has been carried out since 1928 and only was only stopped in WW2 during the German occupation of Belgium. Every group I take over attend a ceremony and many lay wreaths on behalf of their school. This was the case on the night of 21st March when two pupils from Lydiard Park Academy laid a wreath. It is always a humbling experience. The Norfolk Regiment panel on the Menin Gate. Tyne Cot is the largest Commonwealth cemetery in the world. It now holds the remains of 11,962 men, 8,374 of those are unidentified. At the rear of the cemetery the Tyne Cot memorial records the names of 35,000 men who have no known grave and whose names could not be put on the Menin Gate Memorial. Within Tyne Cot there are 7 identified Norfolk Regiment men and 257 Norfolk Regiment are commemorated on the memorial. 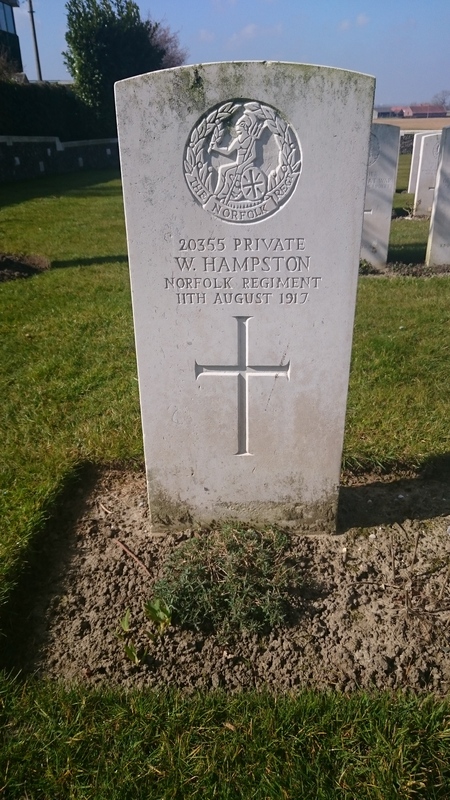 One of the Norfolk Regiment men buried in Tyne Cot is William Hampston 11th August 1917. William was born in Kirton In Lindsey in Lincolnshire and was living at 7 Melbourne Street, Kings Lynn working as a Butchers Manager and was the son of Rebecca Hampston. The grave of William Hampston in Tyne Cot Cemetery. On the day that William was killed the 8th Battalion were in the line around Inverness Copse. The Germans attempted a number of attacks on a strong-point vacated by the 11th Battalion Royal Fusiliers. The Norfolks were ordered to counter attack which they did and the strong-point was recaptured and consolidated. The Germans attempted a number of counter attacks, all of which were beaten off, and the battalion then reorganised the line. In this action the 8th Battalion lost 60 men killed. 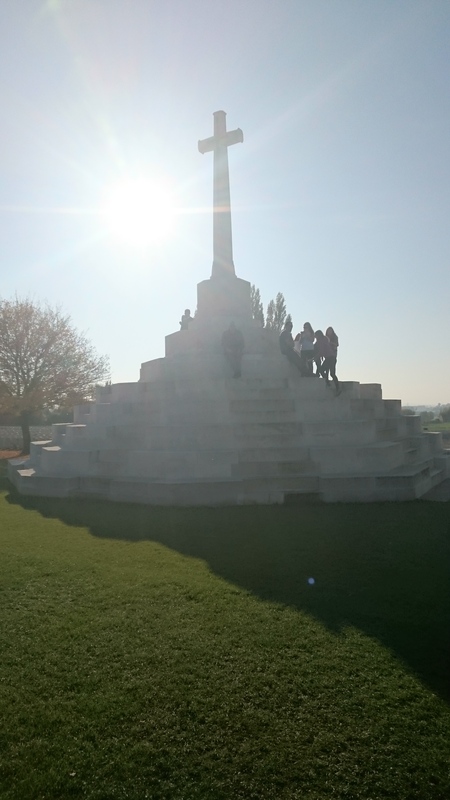 If you do climb up the cross of sacrifice and look back towards Ypres it is a good place to stop and reflect on the sacrifice made by men from the Norfolk Regiment who now lie in Flanders Fields. This entry was posted in Visit to a WW1 related location. Bookmark the permalink.